The Remembering Flodden Project has been working since 2003 to promote the site of the Battle of Flodden as a historical and heritage site. It is an entirely self supporting locally-based charity. It relies on sales and donations in order to continue it's work of maintaining the Flodden Battlefield Trail, conducting research ontp the battle, discovering exactly what happened during the event and investigation those who took part in the conflict. 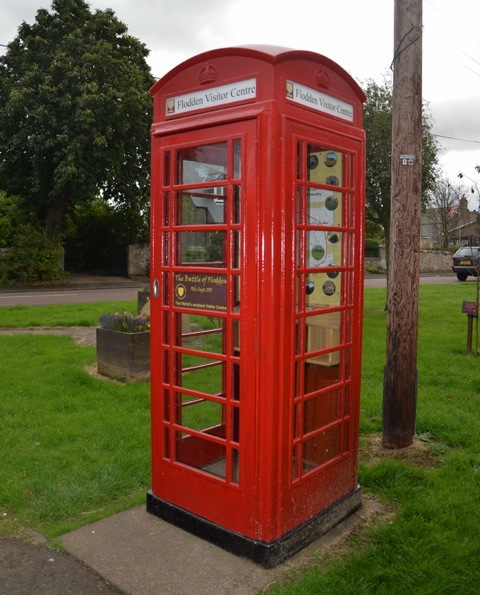 Although our funds cannot possibly match the five million pounds reecently spend by the Scottish Government updgrading the Bannochburn Visitor Center at Sterling, the decommisioned red telephone box in Branxton village has been converted into perhaps the world's smallest visitor center! The Flodden Visitor Center displays a map showing the routes of the two armies to battle, and gives information about related sites in '1513 Country'. The Remembering Flodden Project works closely with The Battlefields Trust (www.battlefieldstrust.com) who consider Flodden to be one of the three most important battlefields in the United Kingdom, and one of only three battle sites where a monarch lost their life. The Battlefields Trust work to save battlefields from destruction by motorways, housing developments etc, provide a range of battlefield-related activities and information, including the quarterly journal 'Battlefield', battlefield walks and conferences, liase with local and national organisations to preserve battlefields for posterity and to improve the interpretation and presentation of battlefields.